I just bought my latest favorite cookbook called Plenty: Vibrant Vegetable Recipes from London’s Ottolenghi, I have been cooking through the pages recently. The recipes in this book is all vegetarian, but Yotam Ottolenghi, who owns the popular London restaurant of his name sake and is not a vegetarian, has a relaxed attitude toward vegetarianism. 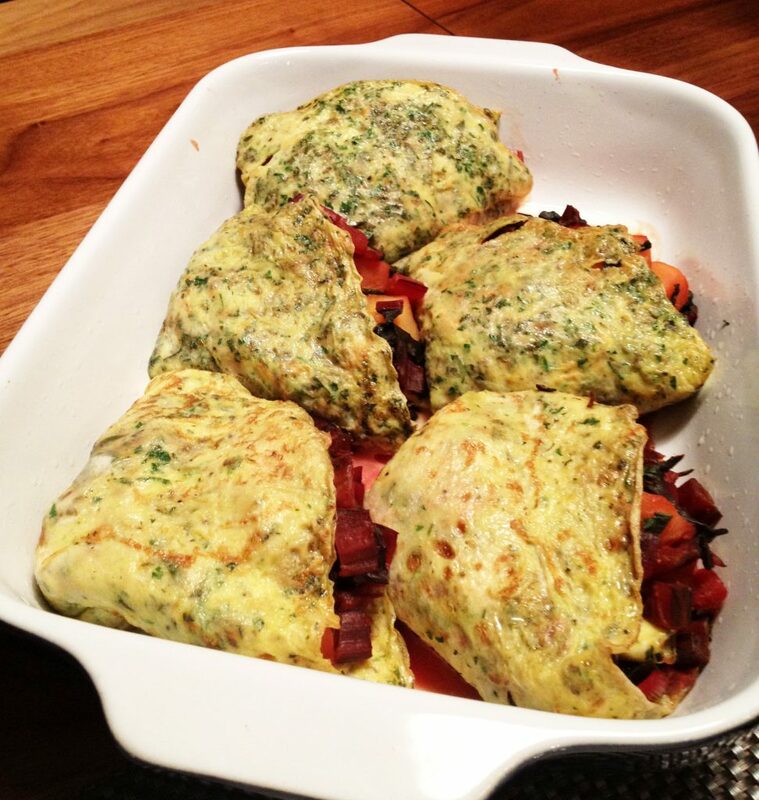 He presents these recipes (with beautiful photos, incidentally) because they are good. Ottolenghi, having grown up in a cosmopolitan atmosphere in Israel, also does not have orthodox attitude toward styles of cuisine, and I find many intriguing (but easy) recipes combining and crossing all cultures. Here is one example of his combining exotic, unexpected flavors with simple technics and ingredients to a great success. 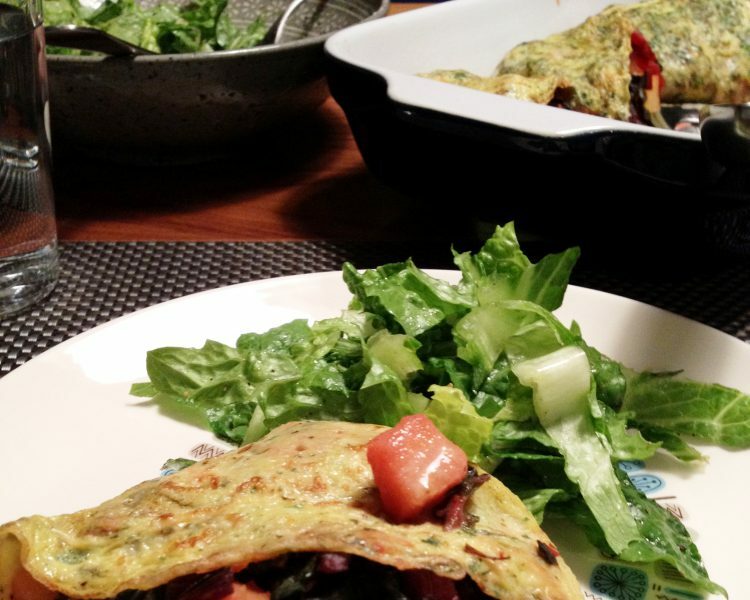 This unusual omelette is uses more of a crêpe making technic. It is visually stunning with the contrast of eggs, vibrant herb colors and rainbow Swiss chard colors peeking through. Simmer potatoes in water and saffron for 4 minutes, then add chard with salt and pepper. I would add thick chard stalks 1 minute or so ahead of the leaves to make it a little softer. Cook covered for 10-15 minutes until the potato is soft. Drain excess liquid, if any. Off heat, add the lemon juice and garlic. Set aside. Whisk together eggs, milk, herbs, and salt and pepper. Make 4 thin round omelettes (almost like crêpes) on 9” nonstick frying pan. You do not have to flip the omelette. Keep them separated by paper towels. Spread cold crème fraîche over half of each omelettes on the side that touched the frying pan. When folded the vibrant herb colors will be outside without any brown cooking marks from the frying pan. Taste the chard mixture and adjust seasoning, then spread generously over the crème fraîche. Fold each omelette over in half, then fold again to get a fan shape. Allow the chard mixture to slightly overflow at the open side. 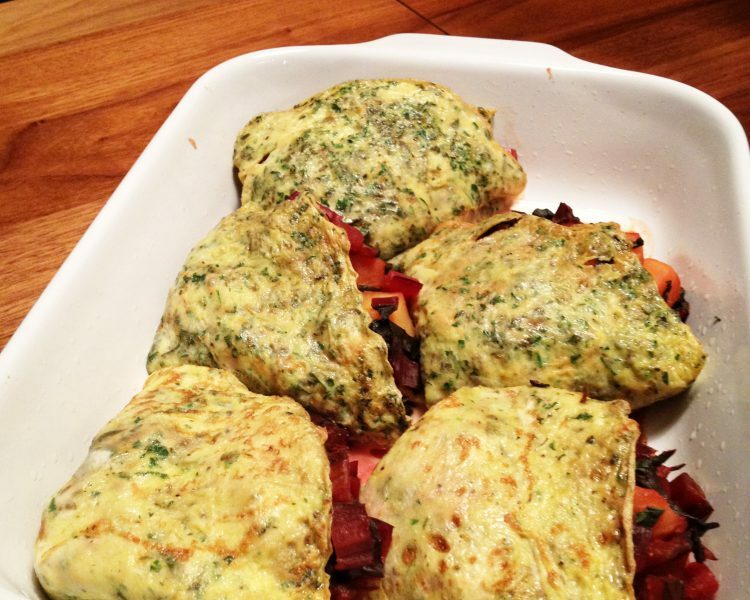 Arrange the folded omelettes in a baking dish (you can keep this refrigerated until ready to be served), and bake it in 325℉ oven for 5-8 minutes. Serve at once with some green salad. 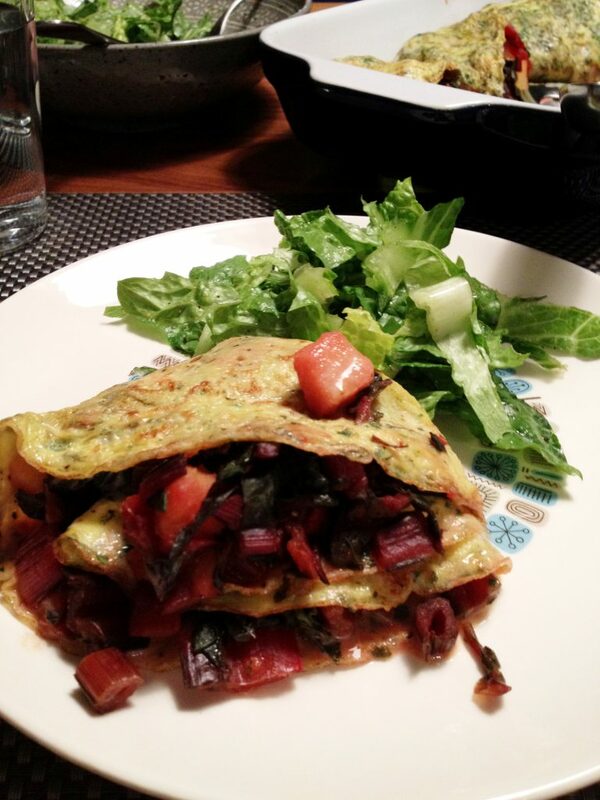 This entry was posted in Recipes and tagged egg, Ottolenghi, Plenty, saffron, swiss chard, vegetarian. Bookmark the permalink.